In the last three years, the Georgian fashion scene has gone through an unprecedented development. Tbilisi became a new hot-spot for buyers and opinion makers looking for authenticity, avant-gardism and exoticism. The capital of Georgia certainly took advantage of the dynamics ruling and extending the global fashion market – as did other capitals with less success. In a highly competitive market, it has somehow become a requisite for capital cities to have their own fashion week like those in NY, London, Milan, Paris and Berlin as a visual demonstration of wealth and taste. So why and how did Tbilisi become the new fashion destination in Europe? How could this attractive industry serve as a soft power tool on the road to European integration? Part of the answer has to do with shared European culture and public diplomacy [JB emphasis] . Since Soviet times, fashion has been influenced by or even associated with politics and political claims. Back then, fashion trends were largely copied from the West and were either readapted to meet the shortcomings of the Soviet production or exaggerated to visually convey western political views. In the first case, fashion was infused with ideology and clothes and became part of the state propaganda on equality, simplicity and utility. In the other one, alternative fashion and blue jeans especially became means to express a set of beliefs and representations directed against the hegemonic culture imposed by the Soviet regime. By the end of the Cold War, the Western lifestyle won the cultural competition against the East and European brands and their counterfeits became the norm in modern Georgia. During the last quarter of the 20th Century, European taste and fashion sense began to deeply influence the young Georgian fashion scene. 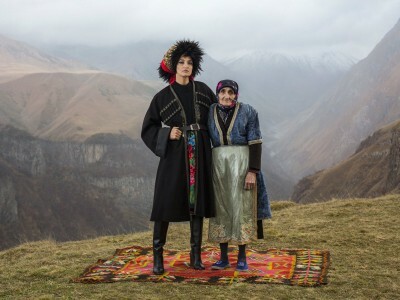 And as fashion is a reflection of social and cultural identities, integrating it into the broader and ongoing discussion on the Europeanness of Georgia matters. Only recently did Georgian fashion manage to reverse the lasting diffusion of trends from the West to the East. Although trends are cyclical, fashion remains driven by a constant search for novelty and rupture with the past. Since 2016 marked the revival and reinterpretation of nineties-inspired rave fashion, time was right for Eastern European countries to sell their alternative version of the nineties, also known as the “post-Soviet” aesthetic. This label is perceived as a foreign invention, made for the ease of characterisation of a relatively unknown geographical area in the international fashion scene. In terms of style, the “post-Soviet aesthetic” refers to the same looks found in the nineties in Georgia: a confusing mix of leftovers from the Soviet period with an abundance of consumer logos from Western sportswear brands. This is a popular style among Georgian ravers, with labels like Situationist or Gola Damian being directly linked to the Georgian underground scene. Tbilisi’s breakthrough in the global fashion industry hence came hand in hand with the rising popularity of the techno scene in the region and Europe. The distinctiveness of the “post-Soviet” style is its ironical approach to dominant beauty standards, which relied on making “poor” fashion trendy. This was a true innovation in fashion worldwide. Model agencies took notice of this trend very soon as international brands kept asking for models who look like Russian criminals. In the context of the country’s EU integration, it is not only crucial that Georgia considers itself European, but also that Europe recognises Georgia as such. This makes language, discourses and representation abroad strategically important. Georgia exists beyond the reference to its Soviet past and the “post-Soviet” aesthetic risks to perpetuate clichés Europeans may have of this geographical area. As a result, the “post-Soviet” label is pretty controversial and reductionist. Actors of the Georgian fashion industry regret that this label is sometimes used as a catch-all category for designers coming from the region, while they propose collections that do not align with this particular aesthetic. However, even if the “post-Soviet” style has successfully inspired Western trends, it does not promote Georgia as a European country but exoticises it. Trends stop being fashionable when repetitively reproduced and mainstreamed, and the “post-Soviet” style marks no exception. Can Tbilisi secure its reputation on the global fashion scene beyond this specific trend? Promising designers are working towards this direction. One aspect of the constant progress in Georgian fashion lies in history and cultural legacy. The diverse influence brought for centuries by the Silk Road,also the successive Persian, Arab, Byzantine, Ottoman and Russian occupations have contributed to the development of a rich cultural scene, with a distinctive character that has survived the Soviet Union. Rediscovering this culture and its traditions can be a way to shed different light on Georgia as an ancient European country rather than as a distant “post-Soviet” state. Promoting local savoir-faire and ancient sewing techniques will also open Georgia to the current shift of the fashion industry towards more sustainable production processes, including greater awareness for social and environmental issues. With the appropriate networks, support and strategy, it is possible to push the reputation of Tbilisi as an innovative fashion capital as well as to make the Georgian fashion industry contribute to the overall development of the country. For instance, the Ministry of Economy and Sustainable Development of Georgia has a governmental programme called “Enterprise Georgia”, which could be used for supporting the promotion of Georgian brands abroad. Another way that has not been explored yet is the network of Georgian Embassies, which could play an important role in promoting this creative potential in their respective host countries by including Georgian fashion in their public diplomacy strategies. This would be beneficial for both sides, first in increasing the visibility of Georgian brands and second in promoting Georgia as an attractive European country with a vibrant cultural scene. Finally, in the long and complex process of the European integration of Georgia, it is necessary to answer one key question: what can Georgia bring to the EU? Innovative cultural industries, especially attractive and popular ones like the fashion industry, can be part of the answer. The recent breakthrough of the Georgian fashion scene in Europe, welcomed and praised by long-established fashion capitals, seems to support this argument. Without yet talking about soft power, popular culture and fashion can be innovative and original areas for Georgia to explore and invest in. Lorraine Vaney is a former intern at the Georgian Institute of Politics (GIP), currently living in Tbilisi. After graduating from the Diplomatic Academy of Vienna, she participated in the #GEOEUvalues-workshop last September organised by Polis 180, Argo and the GIP. Her interests lie in culture and discursive identity in Eastern Europe in the context of the European integration process. Her Master thesis takes a historical and anthropological perspective on the recent creative boom in Georgia, with a focus on alternative fashion and youth movements. The views and opinions expressed in this article are the author’s alone and do not necessarily reflect the views of the Georgian Institute of Politics or the German Federal Foreign Office.